A soup swap is much like a cookie swap, but with soup instead. Everyone brings some soup, you taste and trade at the party, and then get to take some soup home! It’s the perfect get together for a chilly January day. When is National Soup Swap Day? National Soup Swap Day is traditionally the 3rd Saturday in January. I try to host my swap near this date because it’s usually one of the coldest, dreariest times of the year here in New Jersey and the swap is such a fun pick-me-up! What do you bring to a soup swap? 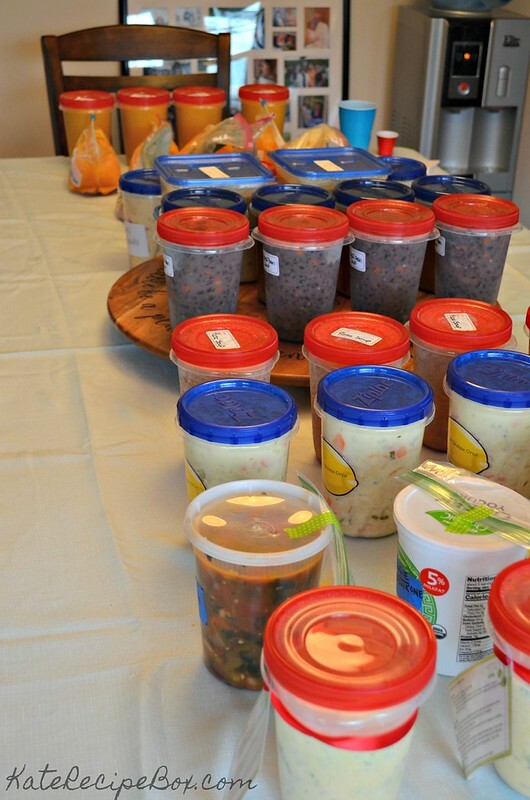 I ask all of my guests to bring 5 quarts of the same soup – 1 for sampling and 4 for swapping. I strongly suggest that they bring their swapping soups frozen because it travels much easier! I find 5 quarts to be the perfect amount for the swap. Most soup recipes make about 3 quarts, so you’ll need a double batch (and have a little left over for your own enjoyment). Being able to take soup home in 1 quart quantities makes it the perfect size for a light meal for 2 people – add some salad and bread and you can stretch that even further. It’s also easy for people to package – there are a plethora of 1 quart containers and bags available. I ask people to share their recipes. I usually send out a digital invite, so a lot of our swap recipes are shared via facebook, but if you prefer printed recipes, make sure you remind people to bring them! Bringing a small cooler or insulated bag is also recommended, as it helps for transporting your soup. How many people do you invite to a soup swap? You can invite as many or as few as you’d like! I find that it works best with 5-12 soup swappers. More than that, and things get a little too big and chaotic – smaller, and you’re lacking the variety that makes soup swaps so fun. If you have fewer than 4 people, just have your guests bring 1 quart of soup per swapper attending, with a little extra for sampling. What soup should I make for a soup swap? Any soup you want! That’s the beauty of a soup swap – because everyone has such different tastes and cultural histories, it’s really fun to have everyone bring something they love! If you’re looking for some ideas, check out my Pinterest Board of Soup Swap Inspiration. What do you do at a soup swap? Most obviously, we sample soup! I warm up everyone’s soup and then put it into sample sized containers. I’ve found these cups work best and I get these spoons for serving. I believe that serving the soup in small containers encourages everyone to try every soup. I also put out sheets for tasting notes so people can keep track of what they liked – you can get a free printable of our tasting notes sheet here. After the soup is sampled, everyone fills out a ballot to vote on favorites, and then picks soups to take home. I set up soup picking draft style. Everyone picks a number out of a hat. Whomever picks number one gets to select the first soup, number two gets to take the second, and so on. When everyone has picked once, we reverse the order for the next round – so the person who picks the highest number will pick twice in a row. We continue until all the soups are claimed! What do you serve at a soup swap? Besides the soup, my favorite soup swap food is grilled cheese! Really, is there anything better to pair with soup? I set up a grilled cheese bar with a few different choices of bread, cheese, and lots of things to top it off with. Once you’ve built your sandwich, you toast it up in a panini press – friends usually bring a few extra panini presses to make the grilled cheese line go faster! 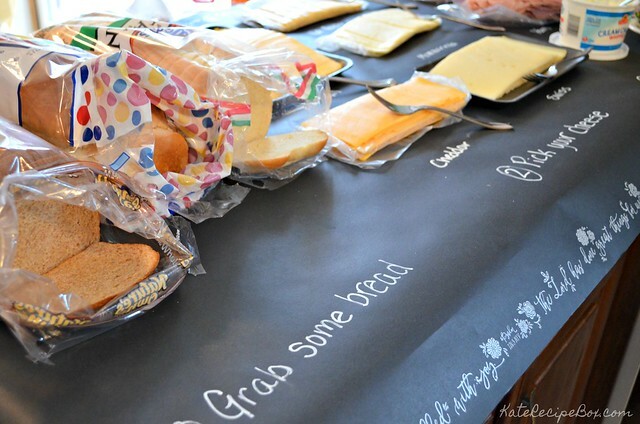 For this year’s grilled cheese bar, we offered wheat bread, white bread, and Italian bread. 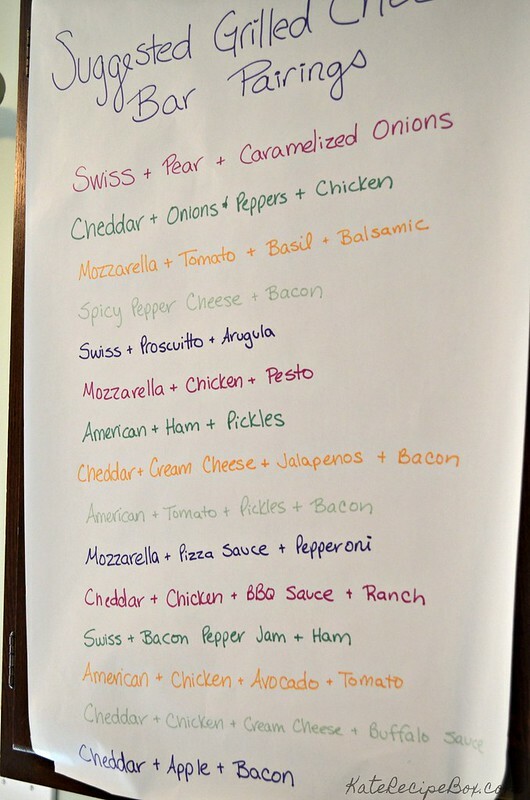 The cheese choices included American, cheddar, spicy pepper cheese, mozzarella, Swiss, and cream cheese. I like to really raid the fridge and pantry and put out as many toppings for the sandwiches as I can. Variety is the spice of life! This year’s bar included arugula, sliced tomato, sliced avocado, caramelized onions, balsamic caramelized onions, ham, bacon, chicken, prosciutto, pepperoni, jalapenos, barbecue sauce, buffalo sauce, ranch dressing, sliced apples, sliced pears, pesto, pizza sauce, balsamic glaze, artichokes, mayonnaise, pickles, fresh basil, rustic herb seasoning, oregano, salt and pepper. 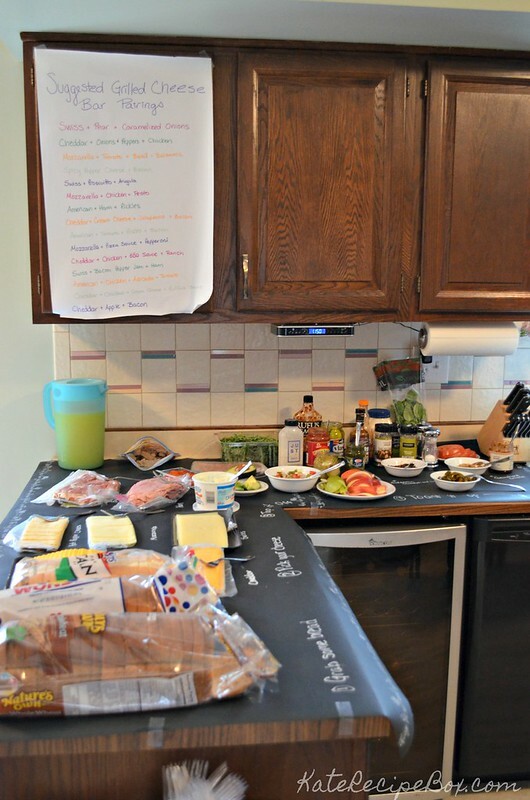 It’s also a good idea to give people some ideas to start with – all of those ingredients can look overwhelming! I like to put together a list of suggested pairings to get people thinking! What awards do you give out at a soup swap? One of the most fun parts of the soup swap is deciding your favorites! Each year, I pick awards categories that fit what kind of soups (or guests) I’m expecting. I originally added Meatless Wonder as a category to encourage more vegetarian options. This year, I added Most Loved Meat to swing the crowd the other way! We also added a Kids’ Choice award this year, since our group has grown to include lots of little ones! 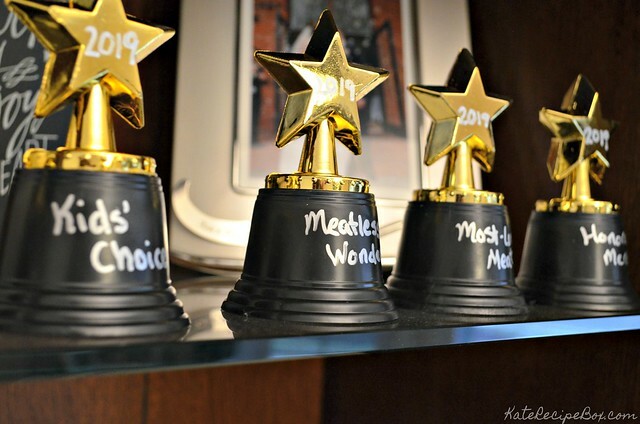 Our full list of awards included: Best Overall, Meatless Wonder, Most Loved Meat, Most Creative, Kids’ Choice, and Honorable Mention. 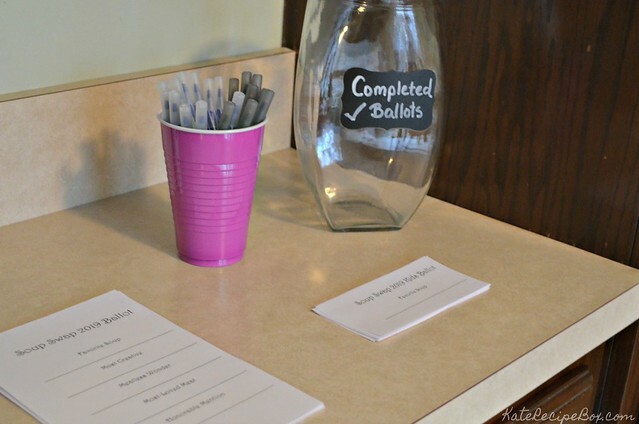 You can find our free printable soup swap ballot here and our free printable kids’ choice ballot here. This year, I decided little trophies would be fun! I ordered these star trophies and added the award names and the year with a paint pen. If you want to get real fancy, I love this soup pot trophy for the big winner! 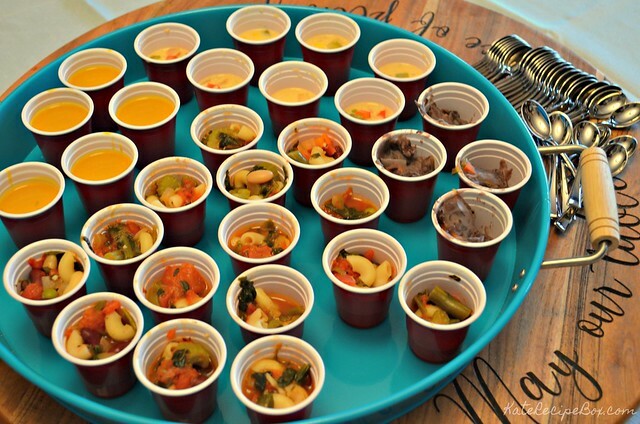 What kind of favors do you give out at a soup swap? Whether a winner or not, I love to have everyone walk away with a memento from the day. 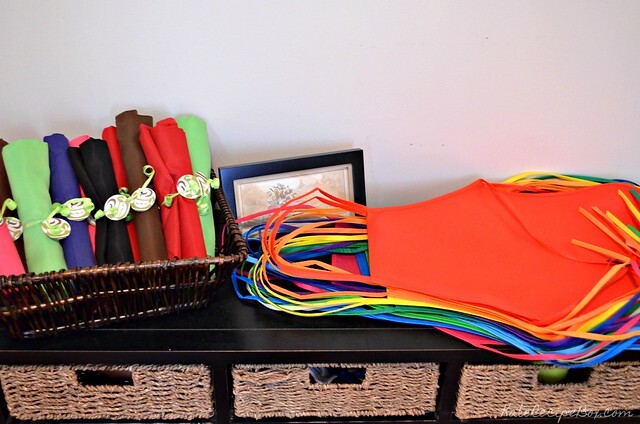 This year, we gave out aprons – full sized for the adults and smaller ones for the kids. Other years, we’ve given out ceramic soup mugs, pot holders, soup ladles, and microwavable soup mugs. Recipe boxes, tea towels, and wooden spoons are also cute ideas! 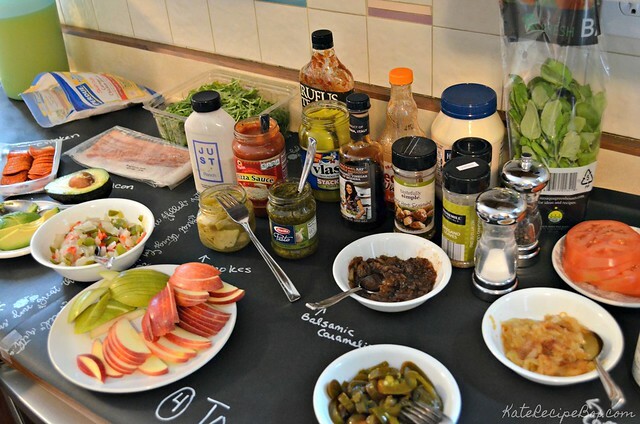 Have you hosted a soup swap party? I’d love to hear about it in the comments! This looks like so much fun! I love the blackboard type paper with the writing on it!